NASA's Mars Odyssey spacecraft turned its multipurpose camera homeward last week and took its first picture -- a shot of a faint crescent Earth -- as the spacecraft heads off toward its destination, the planet Mars. 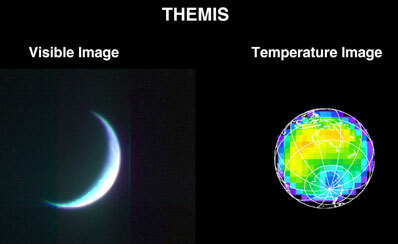 The image was taken as part of the calibration process for the Thermal Emission Imaging System (THEMIS), the camera system that is one of three science instrument packages on the spacecraft. The imaging system will study the Martian surface in both the visible and the infrared and will help determine what minerals are present. It also will map landscapes on Mars at resolutions comparable to that of NASA's Landsat Earth observing satellite. "The spacecraft team did a fantastic job to image the Earth. These images are spectacular, especially given how far away we were. They have given us the first-ever thermal-infrared view of Earth and the moon from interplanetary space," said Dr. Philip Christensen, principal investigator for the THEMIS imaging system at Arizona State University, Tempe. The visible image shows the night side of the crescent Earth looking toward the South Pole. Taken at the same time, the infrared image measures temperature, showing its "night- vision" capability to observe Earth even in the dark. "The instrument measured a low surface temperature of minus 50 degrees Celsius (minus 58 degrees Fahrenheit) for Antarctica in winter, and a high of 9 degrees Celsius (48.2 degrees Fahrenheit) at night in Australia. These temperatures agree remarkably well with observed temperatures of minus 63 degrees Celsius at Vostok Station in Antarctica, and 10 degrees Celsius in Australia. Thus we demonstrated that the instrument can accurately measure temperatures, even from a distance of more than 3 million kilometers (2 million miles)," Christensen said. These observations of Antarctica provide an excellent test for how the imaging system will perform at Mars, where afternoon temperatures are comparable to those in the winter night at Earth's South Pole. The Antarctic continent, which was uncharted less than 100 years ago, was the last landmass observed by Odyssey as it left Earth on its way to Mars. The images were taken on April 19. The Odyssey spacecraft continues to be in excellent health with all its systems working normally. "Not only was this a successful calibration of the instrument, it demonstrated that we can accurately point the spacecraft, and it put the team members through their paces," said David A. Spencer, the Odyssey mission manager at NASA's Jet Propulsion Laboratory (JPL), Pasadena, CA. Today, Odyssey is 4,639,830 kilometers (2,883,050 miles) from Earth and traveling at a speed of 3.3 kilometers per second (7,474 miles per hour) relative to the Earth. The Mars Odyssey mission is managed by the Jet Propulsion Laboratory for NASA's Office of Space Science, Washington, DC. JPL is a division of the California Institute of Technology, Pasadena. The Odyssey spacecraft was built by Lockheed Martin Astronautics, Denver, CO. The THEMIS instrument was built by Raytheon Santa Barbara Remote Sensing, Santa Barbara, CA, and is operated by Arizona State University, Tempe.